On the opening endpapers readers are introduced to two dogs, one quiet and one noisy. 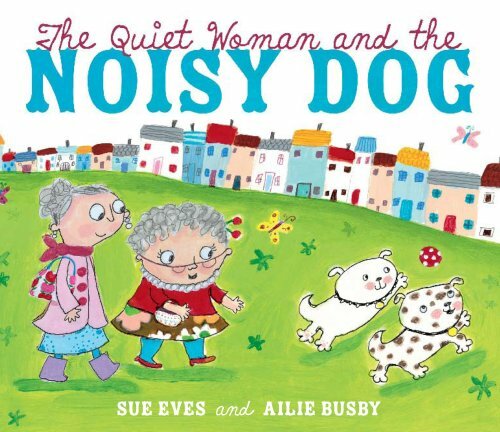 The noisy dog lives with a quiet woman and the quiet dog lives with a noisy woman. One day the four meet in the park; it’s mucky and the owners take the wrong mud-covered pets home. At first they seem better matched, but eventually the dogs miss their real owners and are returned home. A very simple concept is turned into something approaching a little gem through illustrations which capture animals and humans, investing them with character and likeability, and minimal text, which, in variety of size and disposition on the pages, physically plays a part in showing readers what is going on. Bold line is used for the women and dogs, conveying expression through body language and big, expressive eyes, allowing the characters to take centre-stage. Backgrounds are softer, but when the essentials of the narrative are grasped, they provide plenty of enjoyment in humorous visual asides.